Diving Dolphin. Silver italian charm bracelet. 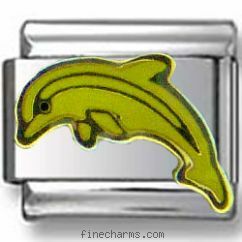 This 9 mm Diving Dolphin Italian charm combines gold toned enamel and glistening nickel-free stainless steel base for a beauty flared with glamour. Set on your bracelet, the dolphin will carry you away to the magic kingdom, impressive beyond imagination. Compatible with all medium size links, the charm looks best with a whole bunch of Italian charms of the same design and color- like Gold Dinosaur, Funny Yellow Dog and Yellow Turtle.